The history of The Farm is one of hardship, love, perserverence and joy. It started on a rocky seven acre farm in Settskogen, Norway in the 19th century, and probably even before that. 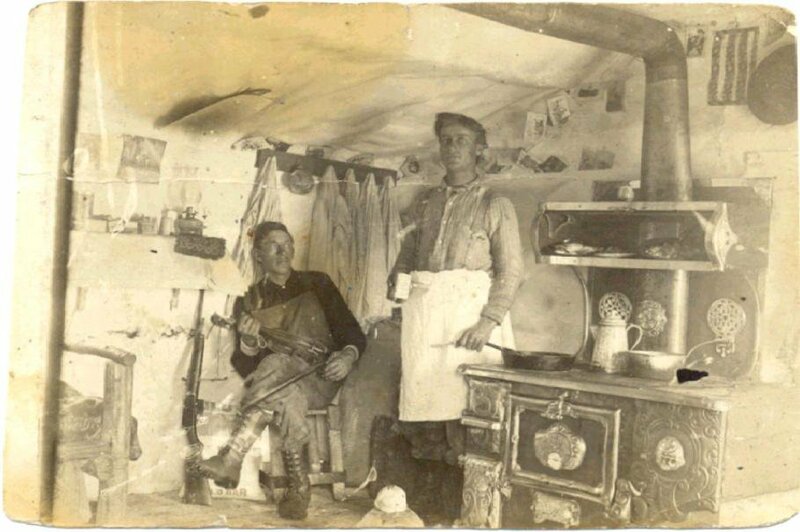 In 1868, Olai Olson, a 37 year-old Norwegian, was doing what generations before him had done and that was to work a small farm, share crops and donate time to a landlord in lieu of rent. It was a hard life, a meager living, the grounds were rocky and the success of the harvest uncertain. Word came to Olai of the opportunities in America, but it took money to realize that dream. America offered political and religious freedom, as well as a new life for his family and the generations to follow. Olai was married to Ingeborg Halvorsdotter and they had 5 children, the oldest of which was 12 years old. Uprooting a family of seven and moving across the Atlantic Ocean was no small doing. But Olai wanted to offer his family something more than what he and previous generations were given, or his children would be destined to repeat history and try sustain themselves on those small, rugged plots in Norway. In a courageous, and perhaps desperate, move the family sold all their belongings and bought fares to North America. 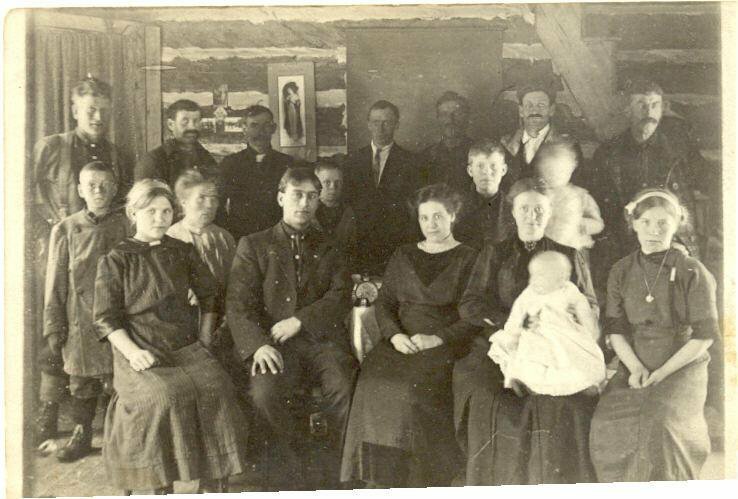 They landed in Quebec in 1868 with a goal to make it to southern Minnesota where other Norwegian families had settled and the farmland was plentiful and fertile. Once in North America, they somehow, through the aid of supportive Norwegian immigrants and with little money, borrowed a wagon and a horse and made the trek across Canada and Minnesota on a winding and rough wagon trail to the Northfield area. Putting a timeline on this trip, the Olsons were true pioneers as Minnesota was granted statehood in 1858, the Dakota Indian war that had consumed southern Minnesota concluded in 1862, and the Civil War that split the nation had only recently ended. The journey across the ocean and North America was a difficult one and like many of the immigrants, 37 year-old Olai fell ill as the rigors of the trip and exposure to disease caught up with him. He contracted cholera and laid in the wagon as the family travelled through Minnesota. As if his mission on earth was accomplished, Olai died once they reached Wanamingo in Goodhue County. His young widow, Ingeborg, grieving and penniless, was in a strange country and her husband had just paid the ultimate price for the betterment of the family and the generations to follow. Realizing her situation, and with no home to call her own, she informed the two oldest boys, Juel (10) and Ole (12), that they must go out on their own to support themselves, as she would have all she could do to raise the three youngest children. Juel and Ole set out together to find work on neighboring farms. In those days young boys could often work as herdsmen (human fences) to keep cattle and goats from straying. Juel and Ole did just that and as the years passed and they matured, they found other work on farms and eventually set up their own households and acquired property. Ole eventually married and had seven children. His brother Juel married Elen Juvland and soon they started their own family on a farm near Northfield. 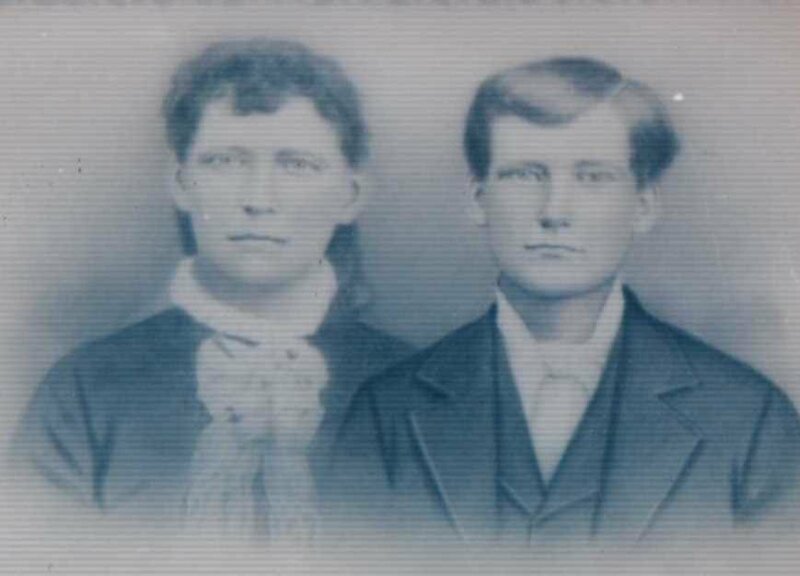 Seven children were born to this couple, two of whom died in childhood. The surviving children were Oscar, Elmer, Julia, Joseph and Adolph. 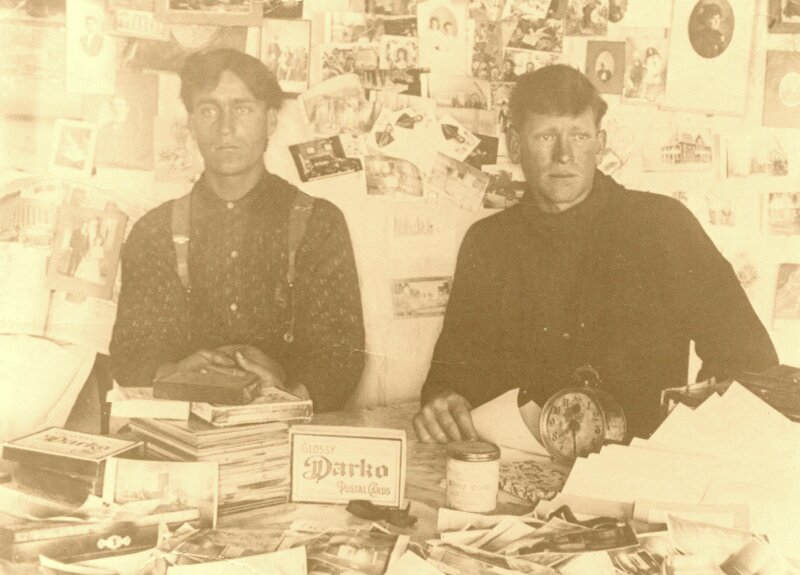 In 1905, Juel's sons, Elmer and Oscar, displaying the adventure and courage they inherited from their grandfather, Olai, left Northfield for the unsettled wilderness of Northern Minnesota. 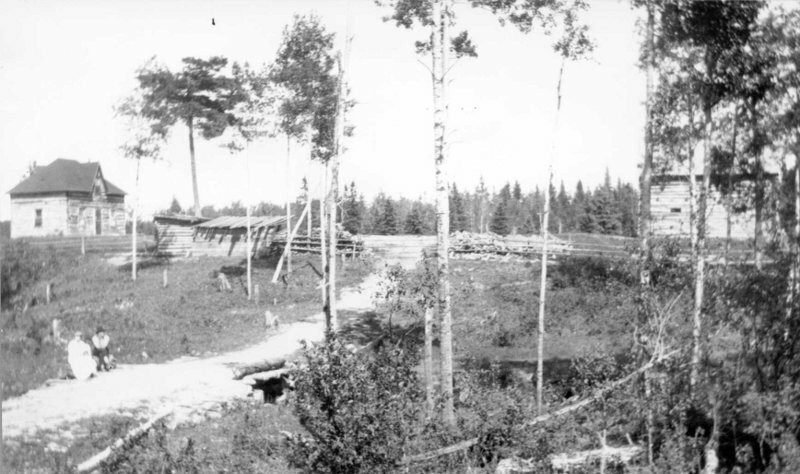 Lured by the "Homestead Act" they set out to explore the wild and unsettled Bear River area. The Homestead Act established a federal program offered citizens in order to populate the vast forests and plains of the United States. Each prospective homesteader was promised 160 acres, but they needed to do several things to qualify for ownership of the land. First, they had to locate their desired plot and make an application or "stake a claim"; next, they were required to build a home; and finally, live there for 5 continuous years. Once they submitted proof of all of this, the government would grant them a "patent" and unencumbered ownership of the land. While it sounded simple enough, only 40% of applicants successfully completed all conditions and received their 160 acre homesteads in this fashion. 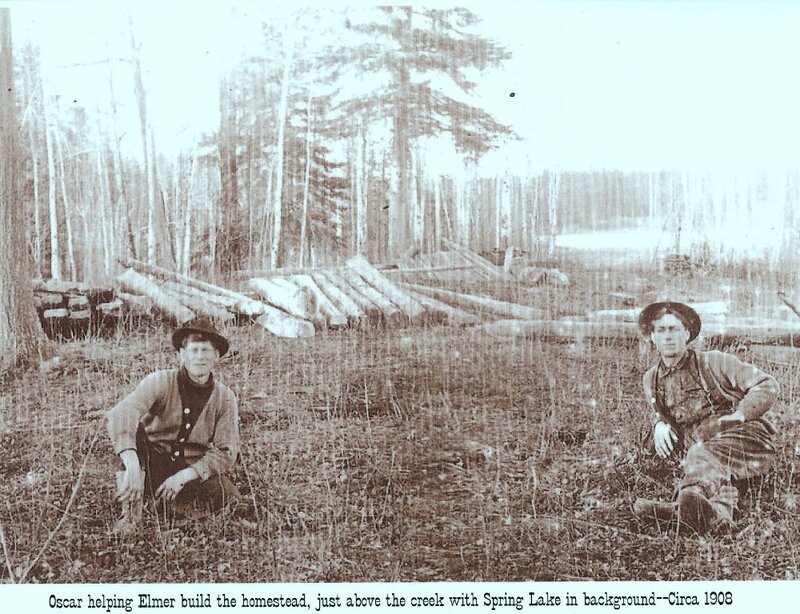 Elmer chose the land we now call The Farm and Oscar the acreage just to the north surrounding Spring Lake. Oscar and Elmer obviously possesed great work ethic, and, fortunately for us, Oscar was also an avid photographer. As a result, several photographs today exist that document our family history. 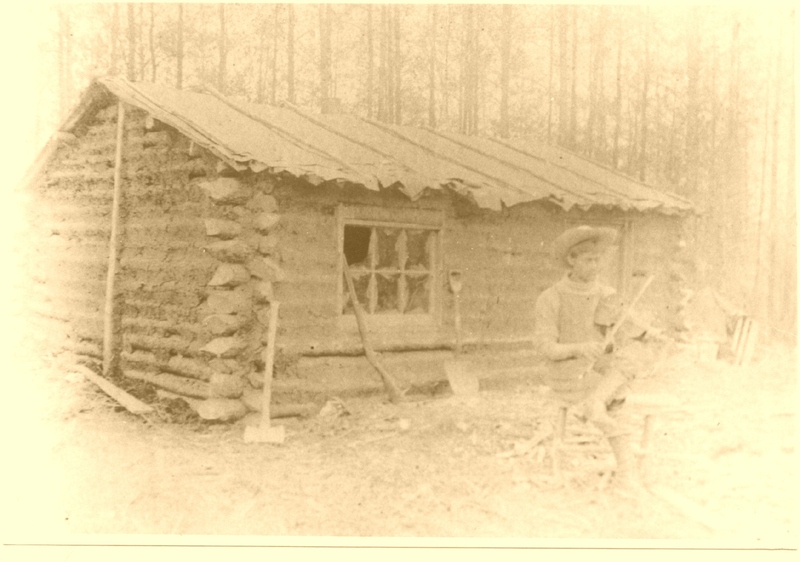 Elmer's first home was little more than a shack, as this was where Elmer would live as he built something more permanent. Oscar built a similar shack on his land for the same purpose. Elmer and Oscar helped each other clear land and make their homes. At that time the area was nothing more than forests with game trails and the work clearing the land was long and arduous. 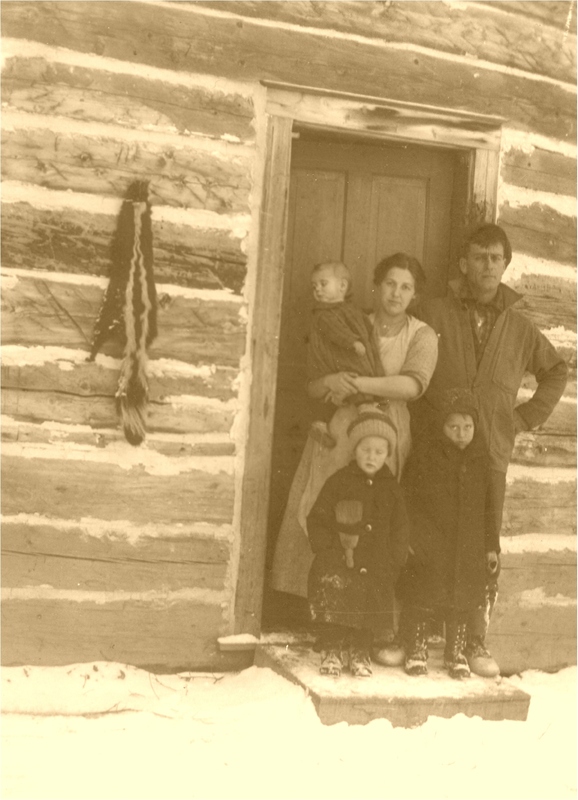 Elmer's first cabin burned down and he was forced to live with Oscar while he built the permanent homestead -- someplace where he could bring his sweetheart, Emma Nelson, to live and raise a family. For a couple years, Elmer cleared the land all year but returned to Northfield in the fall to help his father, Juel, with his Northfield farm. Helping his father wasn't the only thing that brought Elmer back to Northfield, since he managed to court his sweetheart Emma during these visits back home. Even when he returned to Bear River they somehow kept the flame alive for a few years exchanging letters that would take weeks or months to arrive. On October 31, 1912, in Northfield, Elmer married his sweetheart, Emma, and in the depths of winter, January 1913, he brought his bride to their new home in Bear River to begin a life of their own. 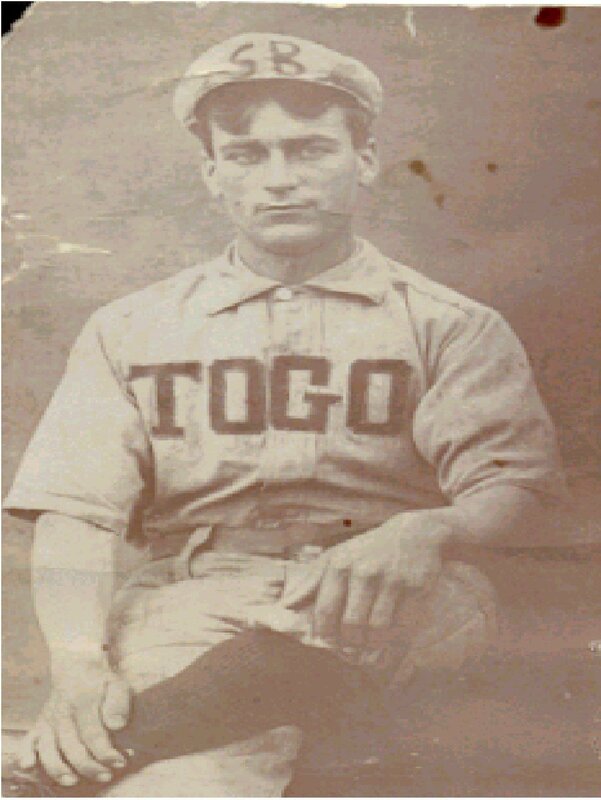 By this time he had completed the conditions of his patent application and in 1912 the Taft administration granted ownership to him to the160 acres that became "The Farm". 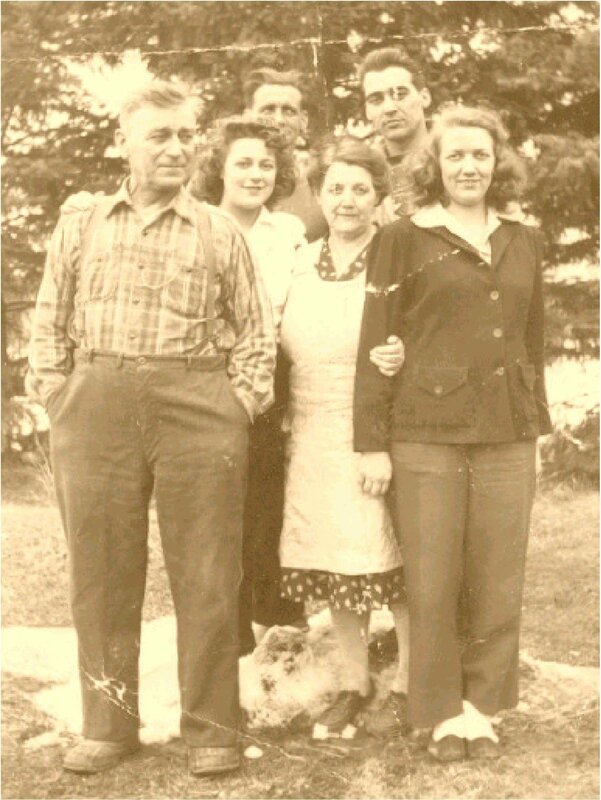 Emma and Elmer had five (5) children: Ernie (1914), Alice (1916), Allen (1918), Kenny (1923) and Myrna, (1925) all born on the homestead. Before they had children, Oscar captured a photo of Elmer and Emma hosting "Ladies Aid" in Bear River, which surely was the social event of the year for the Olsons. While it may sound surprising, the men attended and enjoyed "Ladies Aid", as well, as they needed to drive the womenfolk and children. "Ladies Aid" gave all area residents a chance to congregate and socialize and pull themselves away from the daily labor of survival. Life was hard and the sole source of income was what extras the land produced -- perhaps some eggs or cream. The family grew and in 1935 at the age of 21, Ernie died of pneumonia. 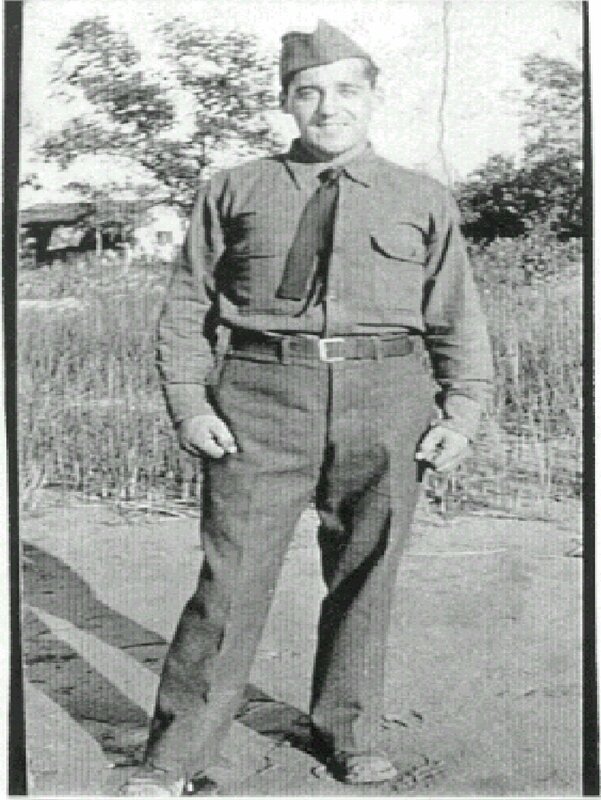 At the time he was living away from home as a member of the depression-era employment program, the "Civil Conservation Corps" (CCC). Since it was a government program, Ernie was considered a federal employee, and on his death at the camp, the government sent Elmer and Emma a check for $5000, life insurance procceeds. Emma and Elmer had never seen more than a few dollars at a time. This amount of money was incomprehensible and acceptance of the check would have been a life-changing event for the family. Elmer and Emma, proud, independent and grieving, declared this "blood money" they would not accept, offered for the loss of their oldest son and they returned the check to the government. 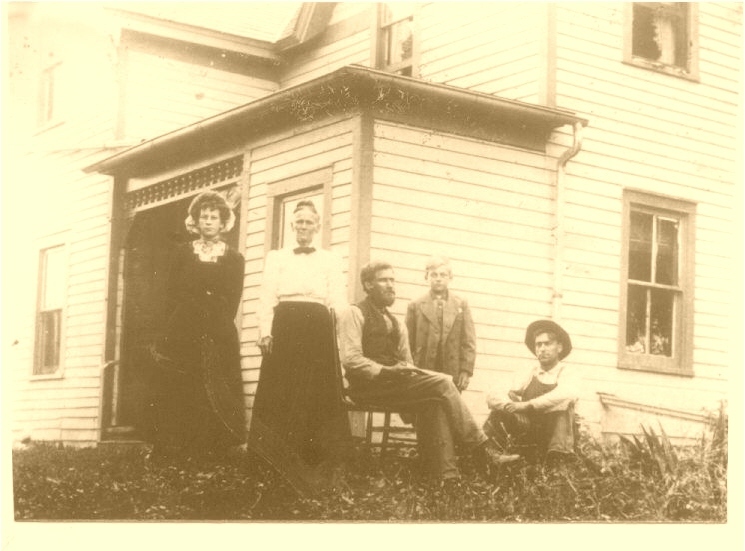 Emma and Elmer's children grew to adults and eventually moved on and out of The Farm. Elmer and Emma remained there to live out their lives. 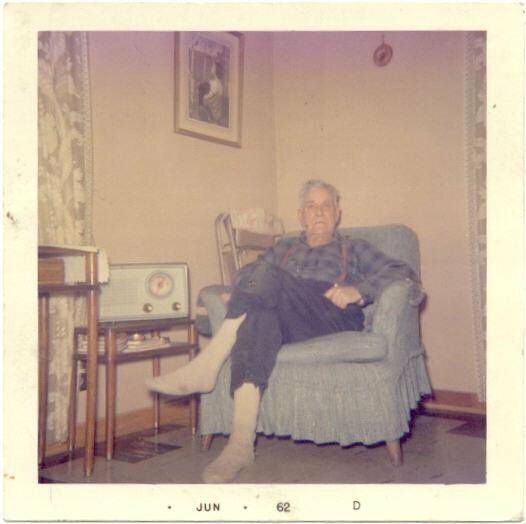 Even after he quit playing ball himself, Elmer was always listening on his old aqua blue radio to his favorite team - the St. Louis Cardinals. On October 15, 1964, Elmer sat in his living room at The Farm and watched his beloved Cardinals on TV. It was a special treat to see them on TV, particularly in Game #7 of the World Series against the New York Yankees. The Cards went on to defeat the Yankees in this Game #7 and no sooner did the game end than an elated Elmer fell over in front of the TV, suffering a stroke and lapsing into a coma. The last thing he would know was that "his Cardinals" were World Champs. Elmer never came out of his coma and died two weeks later on his 52nd wedding anniversary, October 31, 1964. After Elmer died, Emma left The Farm and moved in with her chidren, living with family to family. She died in her sleep on August 9, 1966. 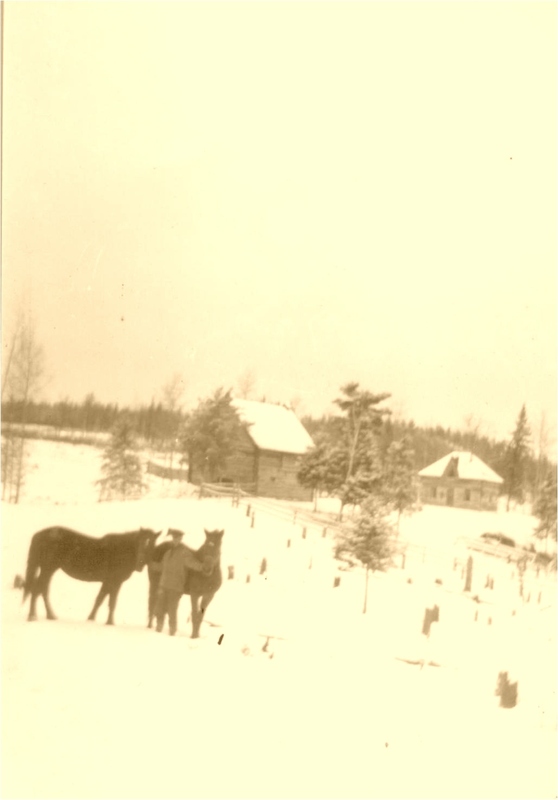 Thereafter, The Farm was cared for by Myrna, Emma and Elmer's youngest, and her husband, Don Persson. Don grew up in Togo, just 10 miles down the road, but he always cherished The Farm and all it represented. 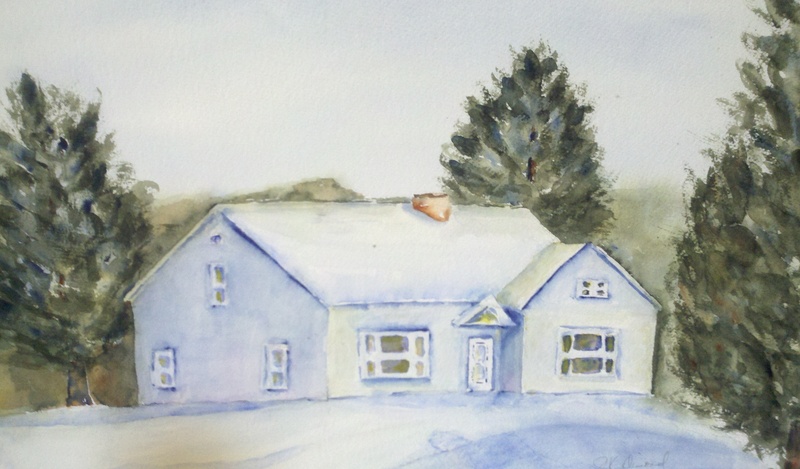 It was a place that signified the closeness of family, love and fellowship, where friends were always welcome and the coffee pot was always "on". Don and Myrna lost a daughter, Donna, at age 5 (1959), but they continued to bring their other children, Denny (1949), Darrold (1952), Debi (1960), Dale (1962) and Dave (1965) to this wonderous place, so full of memories. Years of great fellowhip continued and every work project was a family event and every gathering memorable. Eventually, Don and Myrna's son and their daughter-in law, Darrold and Laurie, purchased the homestead part of the The Farm. 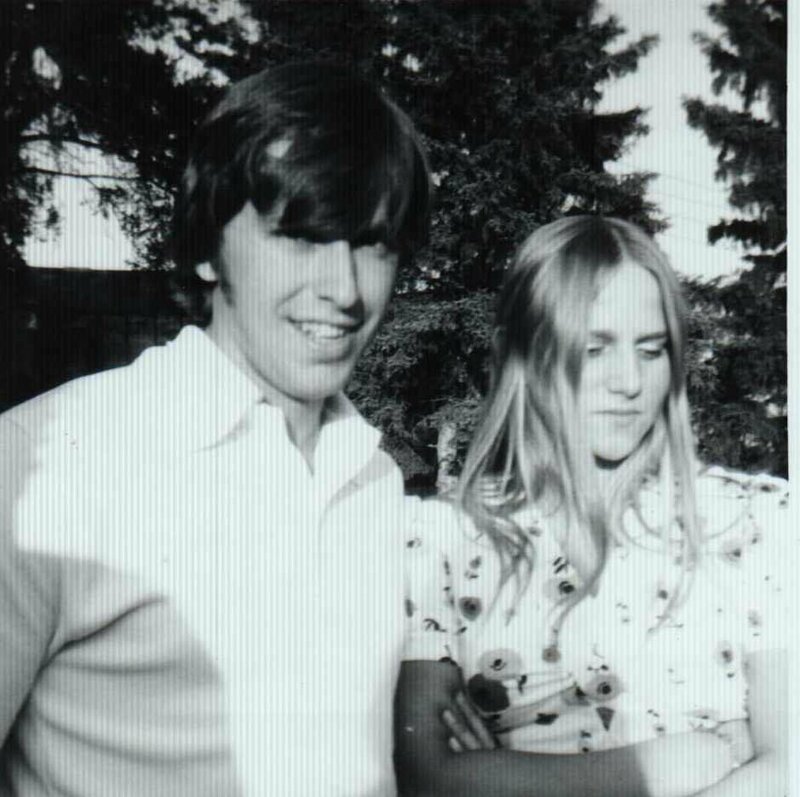 Laurie (Johnson) and Darrold married in 1974. 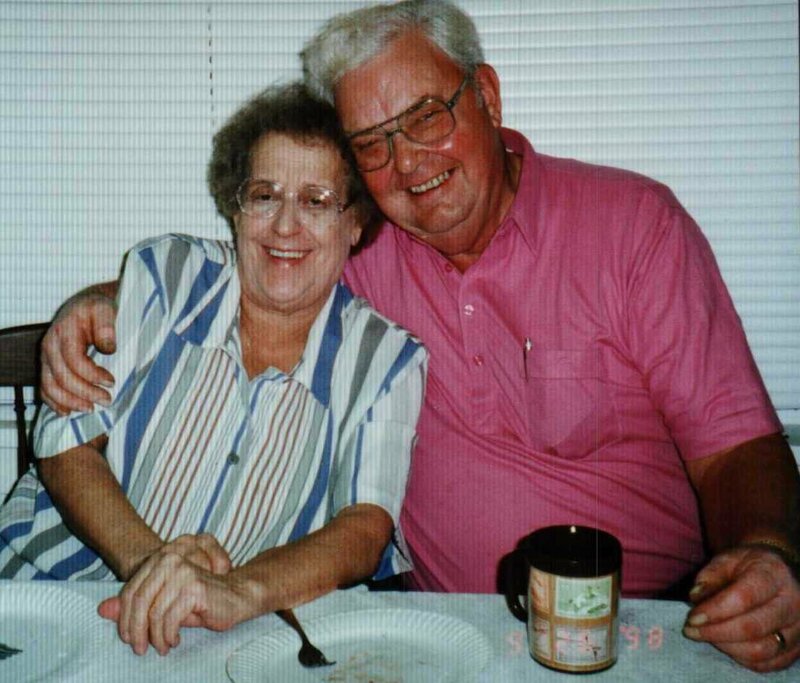 Coincidentally, Laurie's parents (Bob Johnson and Jeanne Hemphill) had both been born and raised near The Farm and had been lifelong friends of both Don and Myrna. 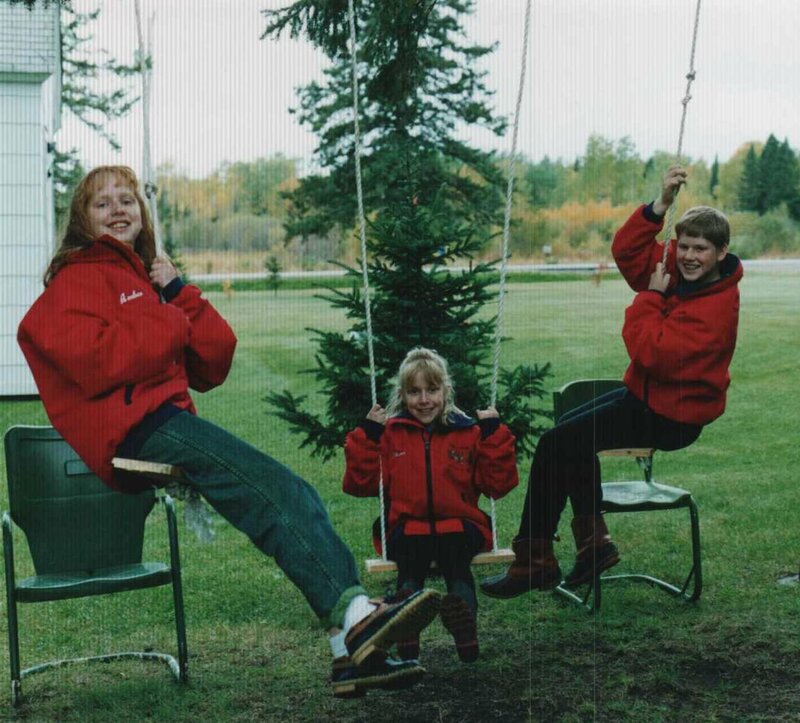 In true family tradition, Darrold and Laurie spent countless days enjoying their own children, Dustin (1980), Amber (1982) and Shana (1985) at The Farm. The Farm has always been a place where familiy and friends' gatherings are commonplace. 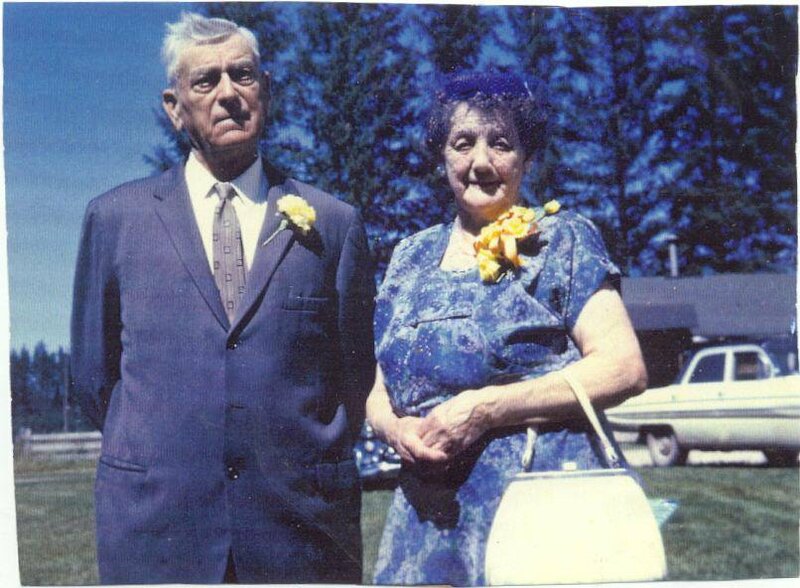 All Elmer and Emma's grandchildren and great-grandchildren remember The Farm as a very special place to be. 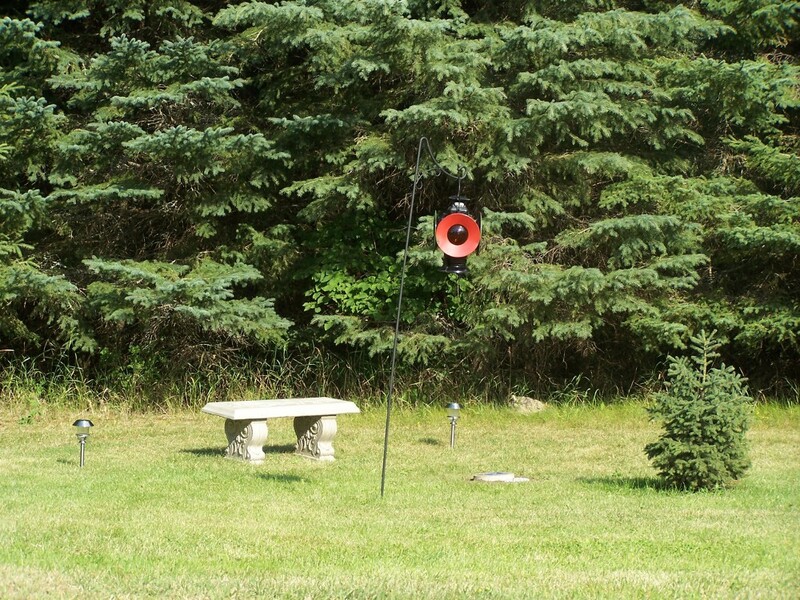 Yard games, card games, camp fires, laughter and good food have filled these many times. While improvements have steadily been made, the deep heritage and memories of The Farm remain unchanged and embedded. In 1982 a well and septic were added and, for the first time, The Farm had running water. 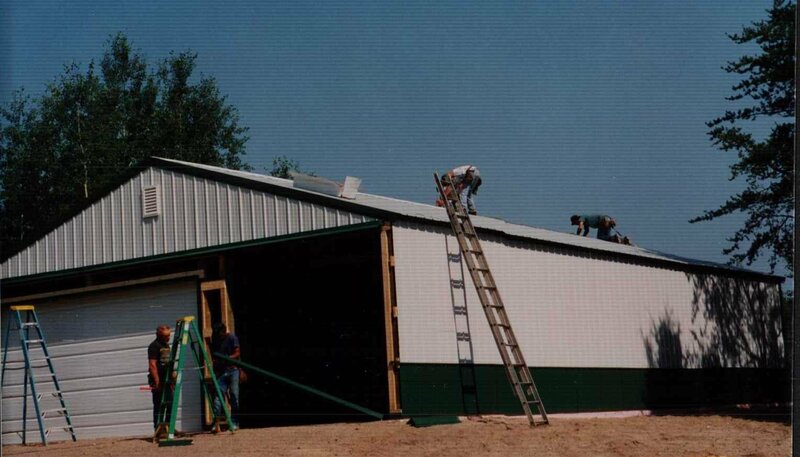 In 1984 a small storage shed was constructed. 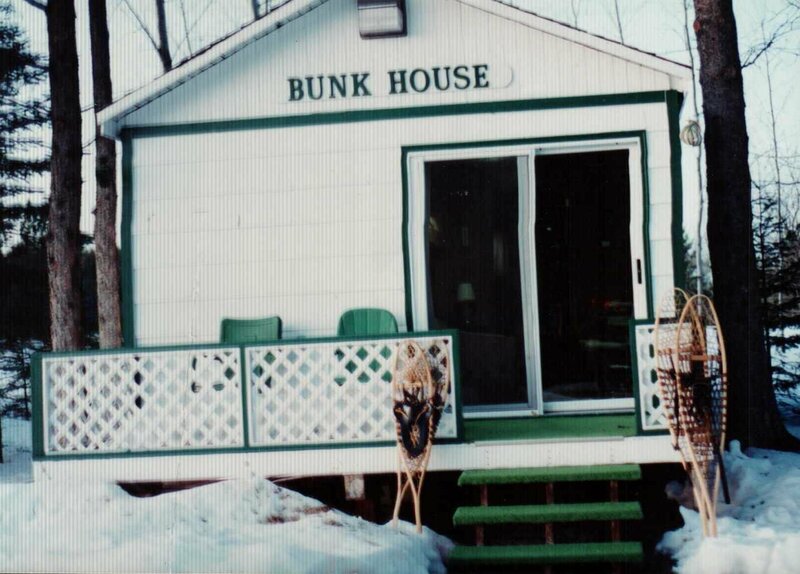 In 1991 a Bunkhouse and 40 acres of hunting land were added. 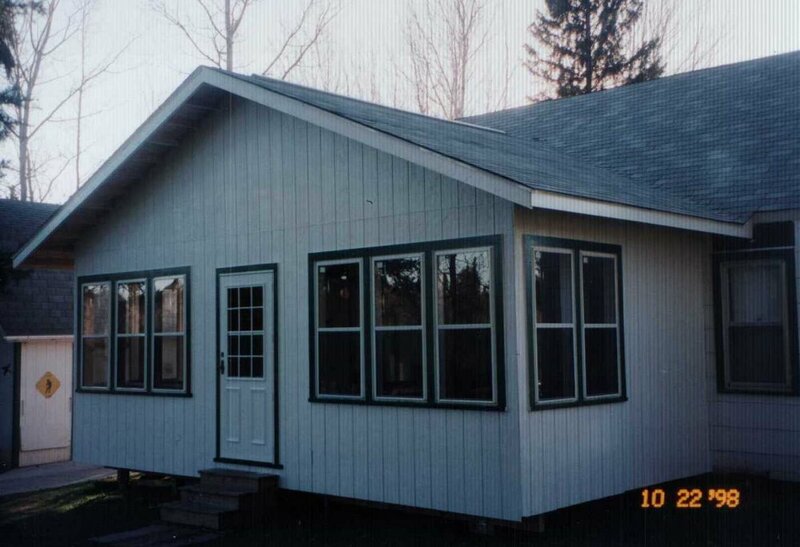 In 1998 a 30' X 54' metal buiding was built and an addition was made to the home. In 2006 another 80 acres was acquired. Don and Myrna's oldest son, Denny, had a hand in every project. His talents were only outdone by his generousity with his time. 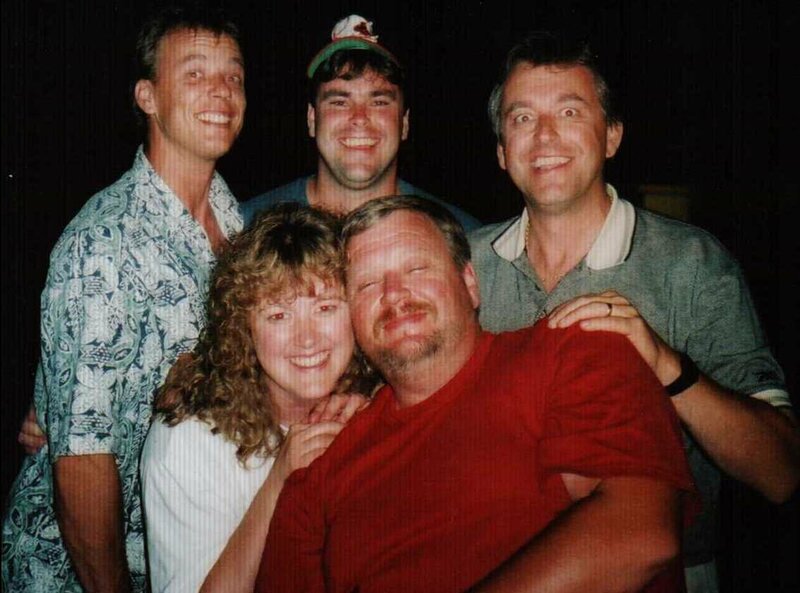 In April of 2005, Denny, whose hard work and ingenuity is evident all over the grounds of The Farm, died unexpectedly at the age of 55. A shrine was erected and some of his ashes buried at the place he so dearly loved. 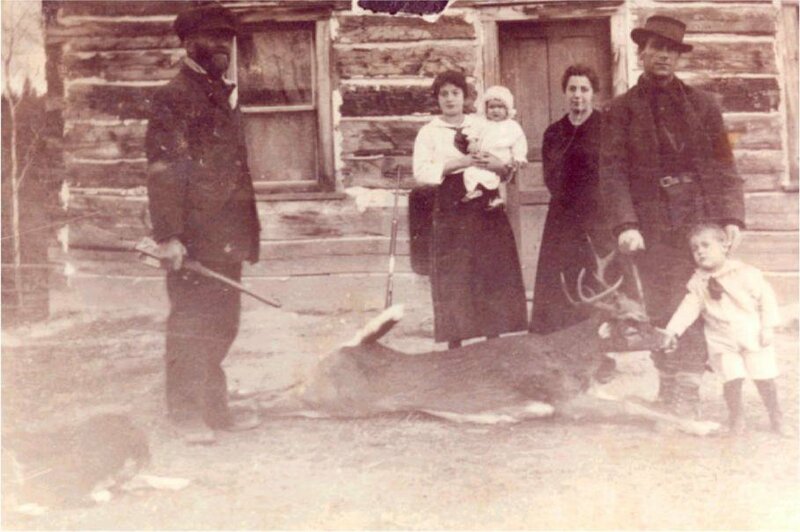 Deer hunting has always been a huge part of the family lore and tradition at The Farm. 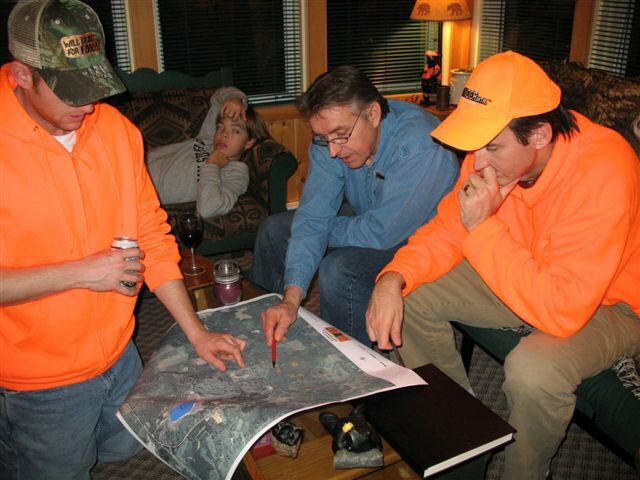 Year after year, deer story after deer story flows as each November brings new hunting adventures. 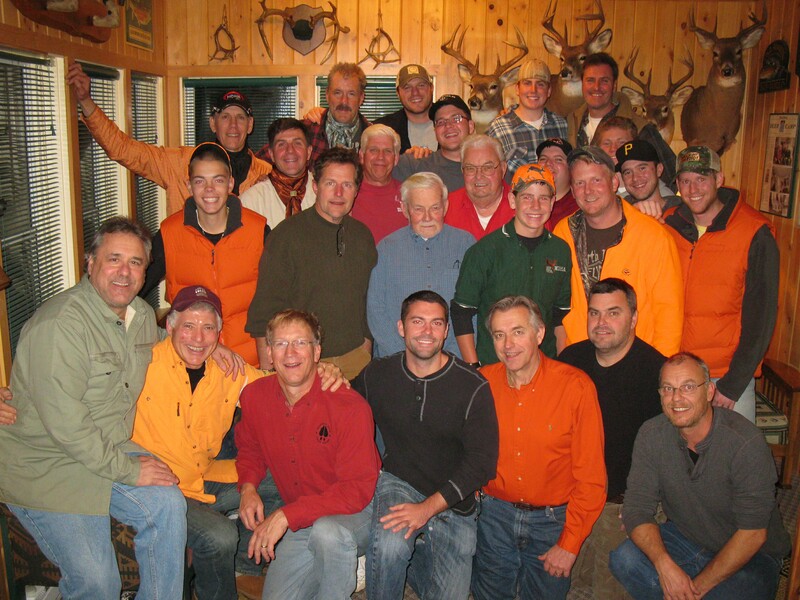 In 2007 The Farm hosted Minnesota Governor Tim Pawlenty and his entourage for the annual Minnesota Deer Hunters' Opener. Governor Pawlenty, his brother and a friend along with four (4) security staff spent the evening at The Farm and hunted the following morning, adding to The Farm's already rich history. strategy for the morning's hunt. (2007) An annual tradition is for "The Farm Deer Camp"
The Farm has always exemplified a family spirit, a heritage of togetherness-- a place to gather with friends and family and celebrate the spirit that Olai, Juel, and Elmer and spouses generated and that Don and Myrna preserved and passed along. That spirit lives on today and that heritage is continually honored in the many gatherings that remain a trademark of "The Farm". 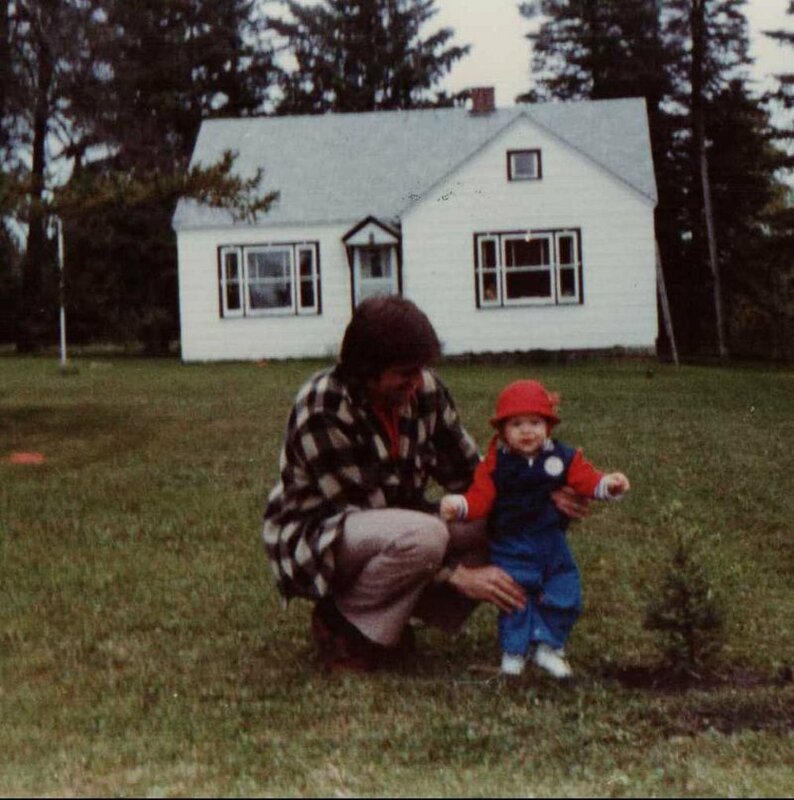 "his" tree at The Farm (1981) The simple and charming beauty of "The Farm"
for her energy and talents in constructing this website.